Black chickpeas are soaked and ground into smooth paste. The paste is then steamed in idli moulds and crumbled. Crumbled black chickpeas is then cooked in oil along with onion and spices. Serve black chickpeas patoli with steamed rice and dollop of ghee. Makes: around 4 Servings Black Chickpeas Patoli. Once steamed, remove and crumble the steamed black chickpeas. When mustard seeds start spluttering, add sliced green chiles, ginger and onion. Fry till onion turns translucent, add crumbled black chickpeas and salt. Fry on low heat for few minutes and remove from heat. Serve black chickpeas patoli with steamed rice and dollop of ghee. Notes: Make sure soak the black chickpeas well. 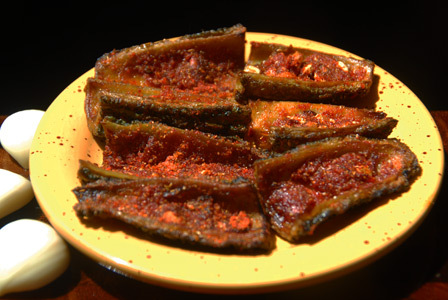 Suggestions: You can adjust spice with green chiles. 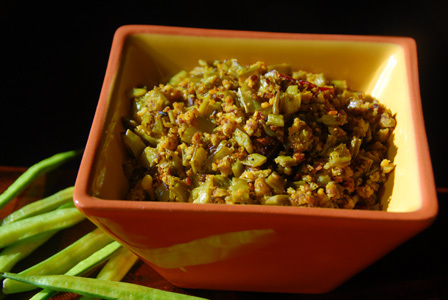 You can also add a green chiles while grinding saoked black chickpeas. Variations: Add a splash of lemon just before serving black chickpeas patoli. Other Names: Black Chickpeas Patoli. Cauliflower is wash and broken into small florets. 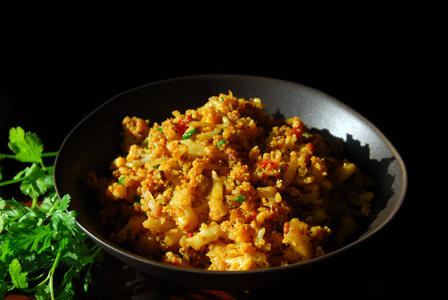 Cauliflower florets are cooked in oil along with whole spices. The curry is finished with spices and chopped cilantro. Serve cauliflower spices curry with steamed rice or with roti. Makes: around 6 Servings of Spicy Cauliflower. Soak whole red chile in warm water for half hour or so to soften. Grind the red chile with pinch of salt into coarse paste. Peel and slightly mash the garlic cloves. Remove outer leaves, wash cauliflower and break it into small florets and wash again. When cloves are plump and cumin seeds change color, add garlic cloves and fry briefly. Add cauliflower florets and cook covered on low flame till cauliflower is soft but not mushy (around 8 minutes). Uncover, add coriander powder, ground red chili paste, turmeric powder and salt. Stir fry for a minute or two to remove any excess moisture and lightly mash to break any big florets. 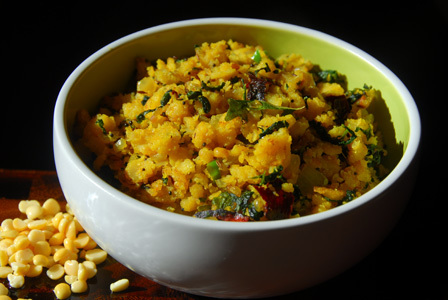 Stir in chopped cilantro and serve cauliflower spices curry with steamed rice or with roti. Notes: Make sure to cook the cauliflower well. Suggestions: If cauliflower is not cooked properly, cook covered on low flame till done. Adjust red chili paste according to your preference. Variations: Check other cauliflower recipes here. Other Names: Cauliflower Spices Curry. Fenugreek leaves are cooked in oil along with onion and spices. It is then cooked with steamed and crumbled chana dal mixture. Serve methi chana patoli with steamed rice and dollop of ghee. Makes: around 4 Servings of Methi Chana Patoli. Wash and roughly chop the fenugreek leaves. Soak chana dal in water for around 4 hours. Coarsely grind the soaked chana dal and salt with few tablespoons of water. Pour the chana dal mixture in idly moulds and steam for around 10 minutes. 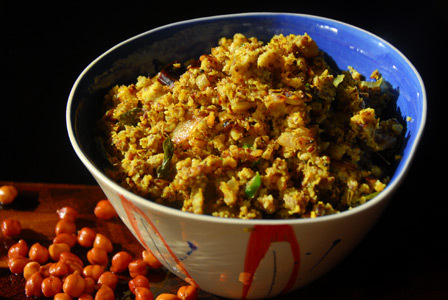 Once warm enough to handle, crumble the steamed chana dal. When mustard seeds start spluttering, add chopped onion, green chiles and ginger. Fry till onion turns translucent, add fenugreek leaves and salt. Fry fenugreek leaves for few seconds, add crumbled steamed chana dal and turmeric powder. Mix thoroughly and cook on low flame for around 5 minutes and remove from heat. Stir in lemon juice and serve methi chana patoli with steamed rice and dollop of ghee. Notes: Make sure chana dal is cooked well before removing from heat. Suggestions: Adjust spice with green chiles or red chiles. Variations: You can also fry the ground chana dal paste in the pan without steaming it though it takes longer time to cook. Check other fenugreek leaves recipes here. Other Names: Methi Chana Patoli.